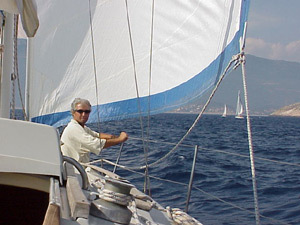 Budgetsailing is represented by Karayel Yachting Ltd., a small family company owned on a fifty-fifty base by Hasan Simsek and Wilma de Haan-Simsek. A valuable partner in the company is the youngest brother of the Simsek family, Aziz Simsek. Following their marriage they settled down in Gocek in 1989 where Hasan became base-manager for a well-known Turkish yacht charter company. 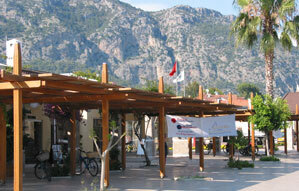 For years he has also been the Gocek representative of the Eastern Mediterranean Yacht Rally. He has been doing this kind of work with much pleasure and enthusiasm. "During a short step out from the yachting world" he got his endorsement as a second mate on a Dutch tanker and has obtained various certificates such as advanced fire fighting, first aid, basic survival training etc. With his experience and breadth of nautical knowledge they finally found an opportunity to start their own business: Budget Sailing Turkey In the idyllic town of Gocek Wilma also became part of the boating world. Firstly, as a hostess for OCC Yachting, then as co-manager in one of Gocek's marinas, then first-mate on a prestigious American yacht and finally as a partner of the family company. She speaks Dutch, English, German, French and Turkish (some Greek and Italian) and will most probably answer all your mail in your mother tongue!